The two villages were born when refugees settled in after the violent uprooting from their homes in Eastern Thrace – area of Kesan – Malgara – Enos and Eastern Rumelia – area of Kavakli between 1922-1924. Until 1998 they comprised the community of Anthia. In 1999 they were united with the villages Doriko, Nipsa, Aetochori, Pefka and Loutra and formed the municipality of Traianoupoli. Nowadays, after the “Kallikratis” plan, these areas- with an approximate population of 1500 inhabitants - are municipal districts of the greater municipality of Alexandroupoli. They are located 11km from the town of Alexandroupoli, 4km from Democritus International Airport and 5km from the beach and their extended plain reaches as far as the Aegean Sea and the nature reserves of Drana and Lakki. Through the years and by overcoming hardships this area evolved without forgetting the customs and the traditions of their ancestors. Agriculture is one of the main occupations in the villages and some of the products are: beetroots, wheat, cotton, corn, while the livestock sector is equally developed and there is also the handicraft of various local products. However, the massive emigration wave that swept through the greater area of Thrace did not leave the villages untouched, since the young people seek a better future either in bigger cities in Greece or even other countries like Germany. Spartakos has 4 groups of folk dancing and singing. There are more than 100 members and the ages vary from 5 to 60 years old. 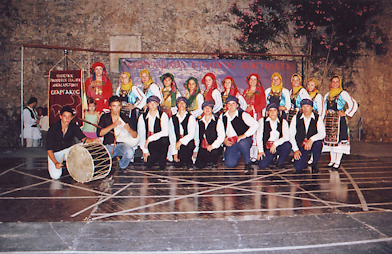 The dancing groups are particularly popular in the area with many performances to be proud of, both in cities around Greece (Kavala, Thessaloniki, Edessa, Florina, Arta, Karditsa, Larisa, Messologgi, Tripoli, Chios, Leros, Mitilini, etc.) as well as abroad (France, Belguim, Hungary, Czech Republic, Finland, Italy, Bulgaria, Turkey). 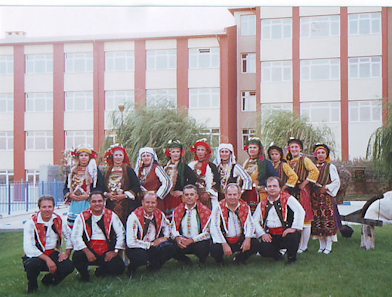 As far as the teaching of folk dances is concerned, the group always tries to stay close to the tradition and presents folk dances accompanied with the traditional clothing of the area. In the vestiary of the group there are replicas of the original costumes from Eastern Rumelia (both male and female), Marides and Metaxades (female)? The teacher is Mr Dimitris Delivasilis and his assistant Mrs. Barbara Ntefidou. For the last twenty years Spartakos has been publishing the monthly local newspaper “To vima tis Anthias”. 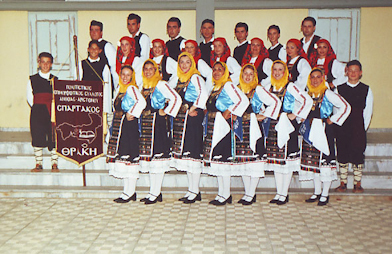 Spartakos organizes approximately 20 social events throughout the year, which have become an important part of the social life in the local society. The association was founded in 1979 under the full name: Spartakos Cultural & Educational Association of Anthia-Aristino and is a non-profit organization. Its members are all the residents of the area of Anthia and Aristino and membership is free. It is member of the Panhellenic Association of Thracian Unions and of the EPOFE – Union of cultural instition in the prefecture of Evros. The yearning and desire, the recreational spirit and mainly our concern and love for Thrace have resulted in great effort and many activities that give a beautiful image of our culture. The participation of young people in the groups is a joint effort that can bring them together especially in times when life is overcome with loneliness, lack of honest relations and isolation. The association can motivate everyone and help them get away from passiveness, inactivity and make them resist to the intrusion of foreign ideals. Tradition and culture are not just museum pieces. From them, we can derive values and models, necessary for the modern Greek society. The aims of our association are to educate, to teach culture, to promote sports and exercise, to entertain, to help the environment. We promote and try to find solutions for local problems. We try to show the cultural and environmental wealth of the area and we cooperate with various other associations both in Greece and abroad. Everyone is welcome! Join us and let’s make this group even bigger! 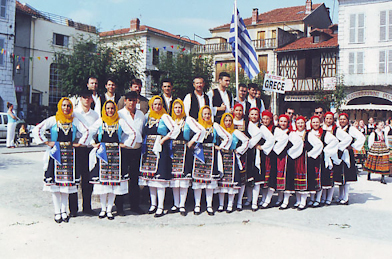 The Panhellenic Festival of Folk Dancing that is organized by Spartakos started taking place in 1995 when a team of enthusiastic young people who loved Greek tradition and more specifically the tradition of Thrace started organizing the festival despite the many difficulties they had to overcome. With a lot of patience, willingness and love for what they were doing as well as the support of the local community they managed to make this into a significant cultural event for the whole of Greece. It is a festival that includes dancing, singing and music and many dancing associations and choirs from all around Greece, Cyprus and other countries participate. Every year 400 dancers join their hands and their souls at this great celebration of tradition here in Anthia. During the festival guests are taken to places of special environmental interest such as the Evros Delta, the Forest of Dadia and several archaeological sites while they can also attend talks about the tradition in Thrace including exhibitions of traditional costumes so that they can learn as much as possible about the area during their short stay here. Furthermore, the dance instructor of our association is available to teach local folk dancing to whoever expresses some interest. TO PROMOTE THRACE. We want to inform people and to present the natural beauty, the traditions as well as the problems of our local area. TO CONTRIBUTE TO THE CULTURAL DEVELOPMENT OF THRACE. Tradition, customs and culture have always been the strongest assets of Greece. TO FAMILIARISE YOUNG PEOPLE WITH TRADITION. It is our duty to conserve our identity but also to point out the significance of our history and our civilization. TO DEVELOP COOPERATION as well as communication and exchange ideas between the members of different cultural associations at all levels. TO GIVE MOTIVES to the locals to work in order to promote their area in any way it is possible. We strongly believe that dancing is not just about the show but the main issue is the joy and happiness the dancers experience. This is what we want to pass on to everyone by explaining and maintaining that we should not dance just on stage but that it should be part of our life everywhere, at home, in the streets. Dancing is an invitation. Visit Anthia and feel part of The Panhellenic Festival of Folk Dancing and Music every second weekend in July.